I wish to offer another genealogical topic of interest. Germans to Ottawa. 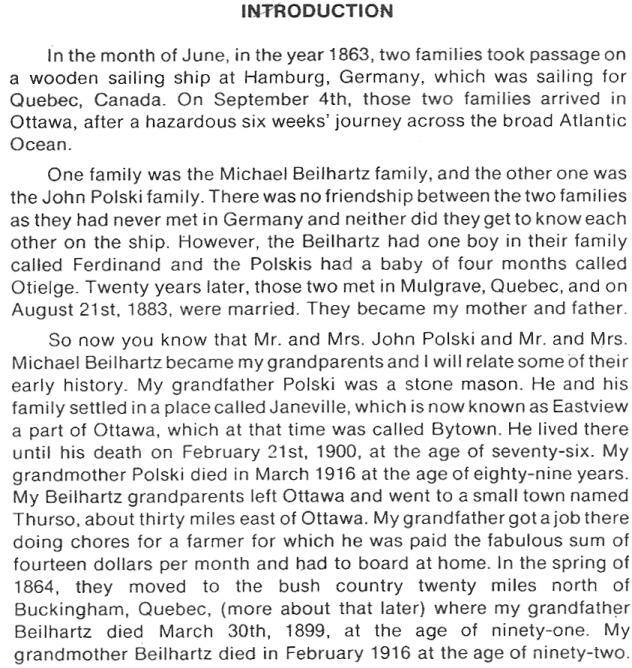 Many of us with German ancestry have deep roots in Ottawa and the Ottawa area. that our early relations brought to this area. My earliest ancestors to this region were Ernst Schinzel and his wife Johanna (geb. Krautwurst). Ernst and Johanna came to Ottawa about 1868 from the town of Geiersthal, district Schwarzburg-Rudolstadt, state of Thuringia. Ernst's occupation was that of a porcelain painter. There was a large porcelain industry in this district of Thuringia. newly formed Capital of Canada. Ernst's name is mentioned in the early town hall minutes as a 'builder of roads'. Ernst and Johanna arrived in Canada with their four children. Emma (my Great-Grandmother), Ludwig, Edward and Otto. 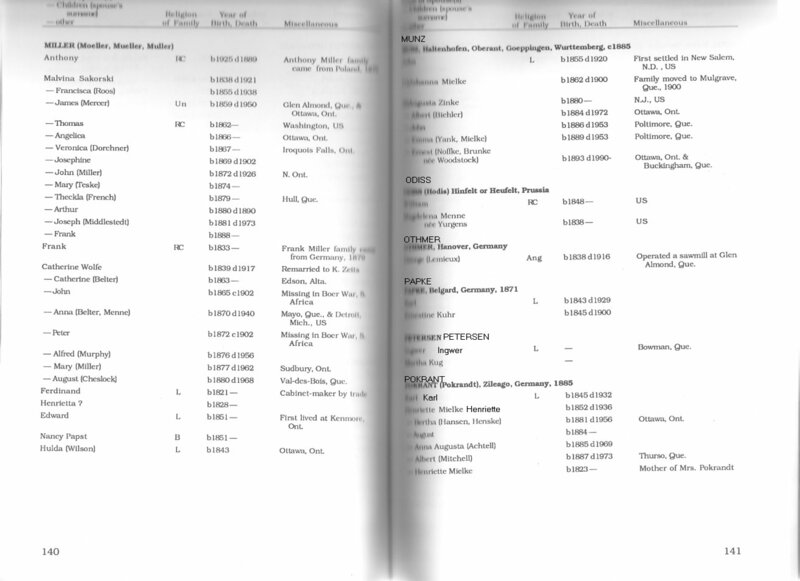 My next ancestors to arrive were the Kalff family from the state of Stolp, Pommern, Prussia. on 14 November 1874. This meeting was held at the home of Heinrich Haul on Cumberland Street in Ottawa. Wobesde, district of Stolp, state of Pommern, Prussia. August Pollex and his wife Auguste (geb. Eick) came to Canada aboard the ship "Kaiser". Their departure date was 10 April 1891. They made their journey with five children: Otto, Franz, Emma, August and Bertha. 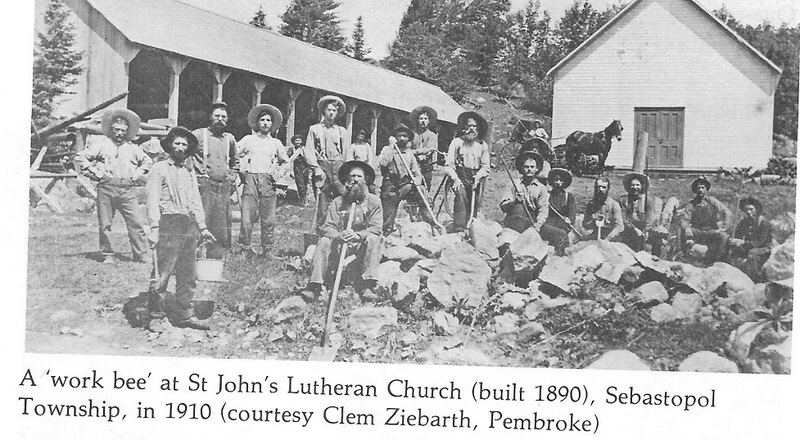 The Kalff's,Pollex's and Schinzel's were also involved in the establishment of two other Lutheran churches. of New Edinburgh where many German families settled in the 19th Century. I encourage everyone with German heritage to contribute their family history to this web-site. Quebec, 1850-1890" by Alice Biehler Burich, 1990. Laplante, died about 1902, the local German ladies looked after the household and children for a time. I have a copy of the book, if ever you might need info on the German families in Mulgrave & Derry. a few years ago, though I have no details on his exact name. Is your friend a descendant of that line? Thanks. Family surnames for the search engine are Verch, Ashick, Witt and Zadow. We have a copy of  the "Memoirs of Reverend J. Samuel Schwerdtfeger", written by his GreatGranddaughter in 1961. He was born in Bavaria in 1734, travelled to Baltimore, Maryland, USA and later to Pennsylvania. "The Saint of the St. Lawrence". I'll add the details of the book (publisher, etc.) so researchers will know of its existence. of the 1910 Rideau League Baseball Champs. with the surnames Noffke, Maihack, Tubbe, Neumann, & Bluhm (or Bloom). 1. Destination: Ottawa Valley, by Peter Hessel, Runge Press Limited, Ottawa, 1984. 3. 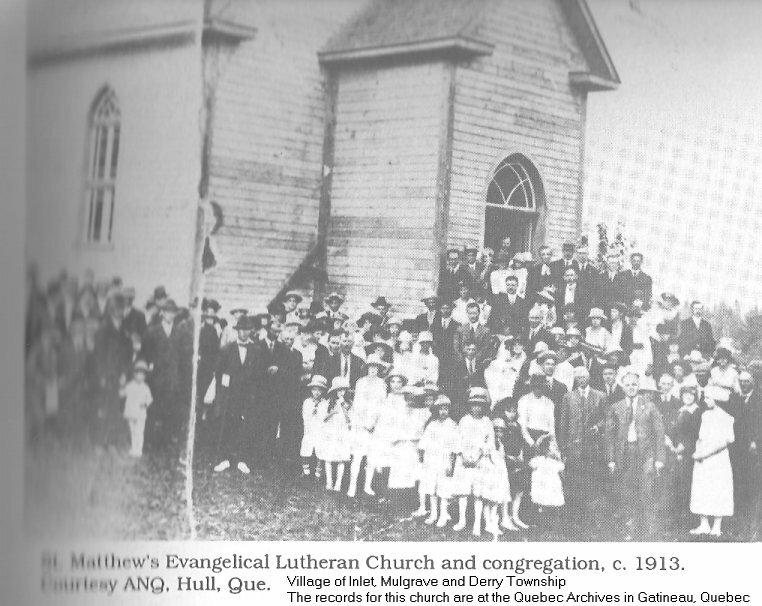 German Immigration and Assimilation in Ontario, 1783-1918, by Werner Bausenhart, ISBN 0-921252-10-2.
church are available from the Archives of the Government of Quebec in Hull (now Gatineau), Quebec. 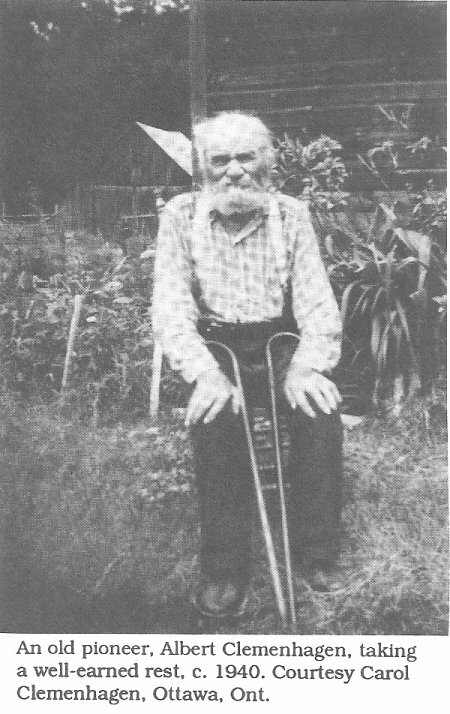 John MIDDLESTEDT / MIDDLESTATE and Appolonia Von ARNDT came from Germany to the Mayo, Quebec, area, in the 1860's. 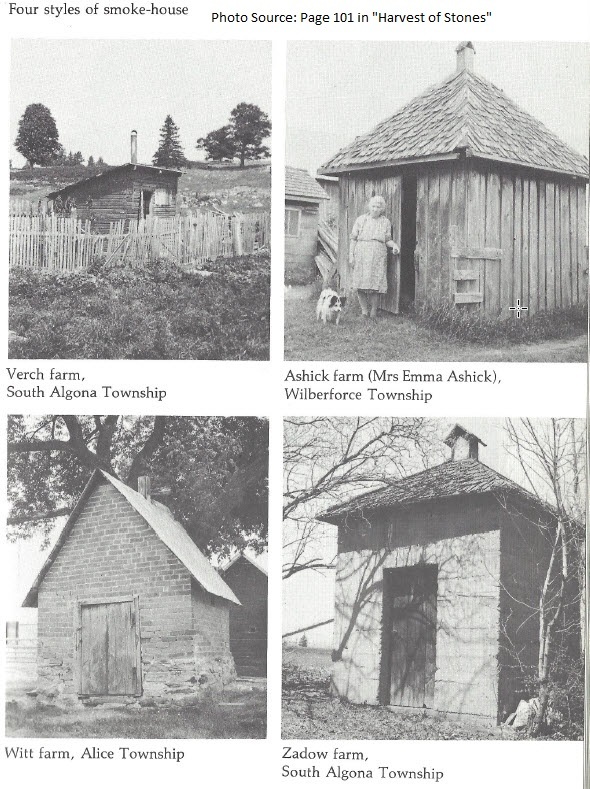 Karen is researching her Mielke family in Mulgrave and Derry Township. Note: Bytown or Bust has a copy of both CDs in our Library. 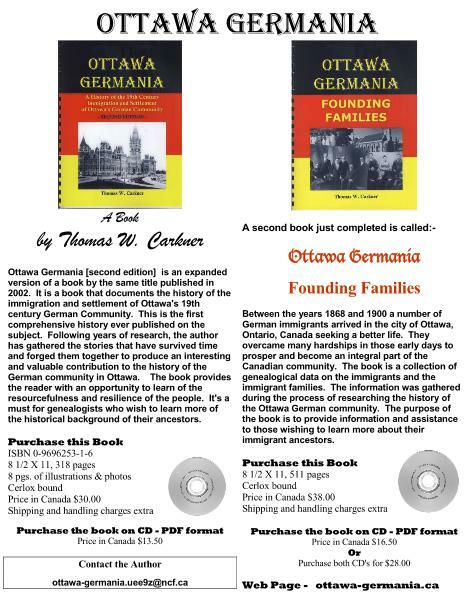 The Library of the Ottawa Branch of the Ontario Genealogical Society also have copies. 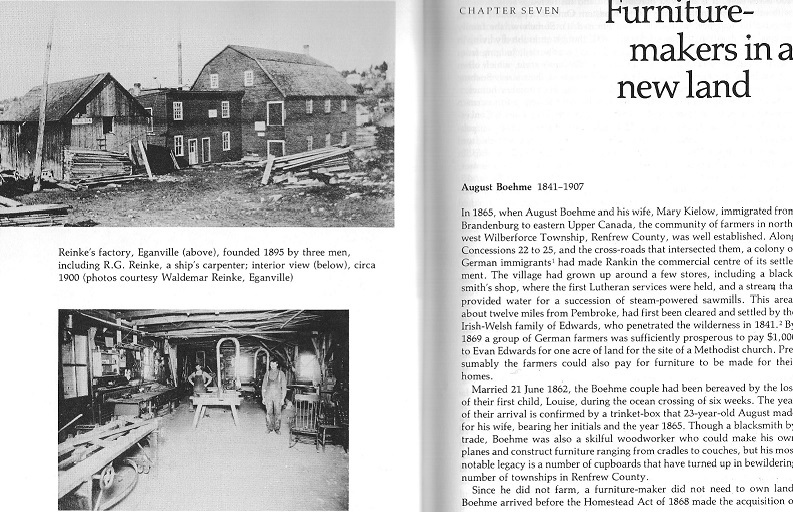 Here is an excerpt from the interesting book 80 Years in the Life of an Algoma Farmer by Russell Beilhartz. This book can be found in the Library of the Ottawa Branch of the Ontario Genealogical Society. Keywords: Hamburg, Germany, Michael Beilhartz, John Ploski, stone mason, Janeville, Eastview, Thurso, Quebec. First Lutheran Cemetery, Palmer Rapids, Concession 17, Lot 23, Raglan Township, Renfrew County. The most common surnames in this cemetery are LENTZ, BIMM, BOEHME, PILGRIM, WASMUND, KLATT, LIDKIE / LIDTKIE / LIEDTKIE. skilled German carpenters. This photo is from the book Harvest of Stones by Brenda Lee Whiting, page 190.